Faba bean (Vicia faba L.) is a legume crop grown primarily for its edible seeds (beans). Faba bean is a major legume seed consumed by humans worldwide. The seeds of some varieties are an important livestock feed. Faba bean is also grown for fodder. Vicia faba is an upright annual forage legume that can grow to a height of 1.5-2 m. It has a taproot and many fibrous lateral roots that explore up to 90 cm of the soil area (Muehlbauer et al., 1997). The stems are coarse, hollow, and unbranched. Faba bean has tillers that grow from the basal nodes. The leaves are alternate, up to 8 cm long, pinnately compound, with 2 to 6 leaflets, without a tendril or with a very rudimentary one. The leaflets are rounded or oval, up to 6-8 cm long and 2-4 cm broad. The inflorescences are borne on short axillary racemes and they bear between 1 and 6 papillionaceous flowers. These flowers are large (up to 3-4 cm long), white or white with black/dark purple spots. The fruit is a dehiscent cylindrical pod, up to 10 cm long and 1-2 cm in diameter. The pods are green when young and turn to dark brown or black at maturity. The pods contain 3-4 oblong-oval seeds (beans) that have a distinctive hilum on their short side (McVicar et al., 2013; Muehlbauer et al., 1997). Vicia faba var. 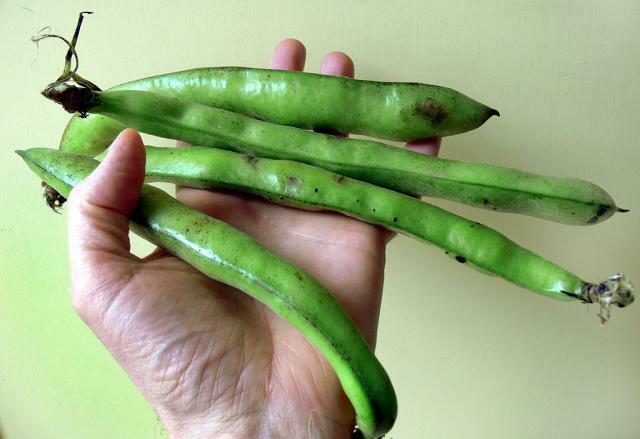 major (broad beans) produces large seeds (650-850 g/1000 seeds). 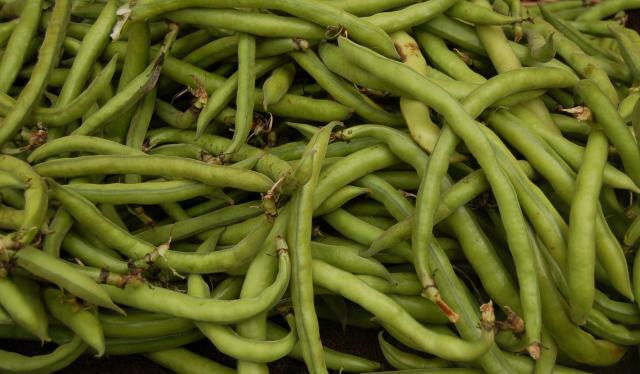 It is cultivated mainly for human consumption, though culled broad beans can be fed to livestock. Vicia faba var. minor (horse beans, field beans) produces smaller seeds (250-350 g/1000 seeds) and is used mainly for livestock feeding. This datasheet does not consider separately the two subspecies. However, nutritional information on faba bean seeds will generally refer to Vicia faba var. minor, since this subspecies is grown specifically for animal feeding. Faba bean is a multipurpose crop used for both food and fodder (hay, silage and straw) (Prolea, 2014). Faba bean is a much appreciated food legume in the Middle-East, the Mediterranean region, China and Ethiopia (Muehlbauer et al., 1997). Faba beans intended for human consumption are harvested when immature. The dried seeds are cooked, canned or frozen. Mature seeds are roasted and eaten as snacks in India, or ground to prepare falafel, sauces and various food ingredients such as meat extenders or skim-milk replacers (Muehlbauer et al., 1997). When faba beans are intended for livestock feeding, small-seed varieties with low-tannin, low vicine-convicine and low-trypsin inhibitor contents are preferred (McVicar et al., 2013). Faba beans have been suggested as an alternative protein source to soybean for livestock in Europe (Smith et al., 2013; Jezierny et al., 2010; Blair, 2007). Faba bean plants can be used to make good quality silage (McVicar et al., 2013). Faba bean straw is valued and considered a cash crop in Egypt and Sudan (Muehlbauer et al., 1997). In Sweden, it was used as a lignocellulosic biomass to produce bioethanol and biogas (Petersson et al., 2007). Faba bean is grown for green manure production or as a legume ley in cereal/legume rotations (McVicar et al., 2013; Muehlbauer et al., 1997). Faba bean originated from the Middle-East in the prehistoric period. Seeds dated from 6250 BCE have been found in Jericho (McVicar et al., 2013). Faba bean is now widespread in Europe, North Africa, Central Asia, China, South America, the USA, Canada and Australia. Faba bean production for food and feed was 4.5 million t worldwide in 2012. The 5 top producing countries are China, Ethiopia, Australia, France and United Kingdom and account for more than 75% of world production. China alone produced 34% of all faba beans in 2013 (FAO, 2014). However, faba bean utilisation and production has been declining in the last decades (by 50% between 1960 to 2010) due to the replacement of traditional cropping systems by industrialized cereal-based systems (Jensen et al., 2010; McVicar et al., 2013). In the EU, faba bean ranks 2nd after field peas for legume seed production and is mostly used for animal feeding (FAO, 2014). Faba bean is well adapted to the wetter conditions found in some cereal-growing areas of western Canada and elsewhere (Muehlbauer et al., 1997). Cultivation of faba bean on irrigated fields is also a good practice, especially on heavy clayey soils (Matthews et al., 2003). Faba bean can be grown as a winter or a spring crop in wetter areas. It requires a cool winter for optimal growth. It can survive frost during the vegetative stage but frost damages flowers and immature pods if it occurs during spring. Optimal growth occurs when temperatures range from 18 to 27°C but heat during flowering and pod-filling hampers yields (Matthews et al., 2003; Muehlbauer et al., 1997). Faba bean can be cultivated where annual rainfall is between 700 mm and 1000 mm, and, ideally, evenly distributed during the growth season (Muehlbauer et al., 1997). In the tropics and subtropics, faba bean can be grown above 1200 m and up to an altitude of 2500 m (Ecocrop, 2014). Faba bean does better on deep, well-structured clayey soils but it can grow on a wide range of soils provided they are not too acidic or saline. Acidic soils with high levels of aluminium and manganese can be detrimental to growth (Matthews et al., 2003). Faba bean tolerates waterlogging and temporary flooding, and does better under such conditions than lentils, peas or common beans (McVicar et al., 2013). Moist and poorly drained soils with a low pH should be avoided as they promote root rot and other diseases (McVicar et al., 2013). Many processes have been developed to improve the nutritional value of faba beans for livestock feeding including: extrusion; infrared heating (micronizing); steaming; autoclaving; and other cooking methods; also dehulling, flaking, soaking, treating with formaldehyde, or stimulating germination (Ferruzzi et al., 2009; Masoero et al., 2005; Vidal Valverde et al., 1998; Gatel, 1994; Tewatia et al., 1995). These processes aim to inactivate the antinutritional factors contained in the seeds (see Potential constraints on the "Nutritional aspects" tab), to affect protein and starch digestibility or rumen degradability, or to alter the chemical composition of the seeds. In the case of heat-based processes, efficiency depends on duration and temperature of heating, as well as moisture and pressure during processing (Goelema et al., 1999; Yu et al., 1998a; Gatel, 1994). Technological treatments on faba bean seeds seem to be more efficient in improving protein digestibility in poultry than in pigs (review by Gatel, 1994). Germination decreased in vitro digestibility of OM and particularly that of NDF (Ferruzzi et al., 2009), and also phytic acid concentration (Vidal Valverde et al., 1998). Soaking and germination generally reduced starch, sugars, hemicellulose and NDF concentrations, while increasing cellulose and lignin concentrations (Vidal Valverde et al., 1998). Faba bean is a suitable ley legume in rotation with winter or summer cereals, or cotton (McVicar et al., 2013; Matthews et al., 2003). Early planting promotes better growth and higher yields. It is recommended to sow it very early in spring or at the beginning of winter at sufficient depth (7-10 cm) so that the seed is protected from frost (Prolea, 2014). Faba bean does not require N fertilizer but it requires special attention because it is sensitive to many pests and diseases such as root rot, stem nematodes, grasshoppers and weeds (with which it competes poorly). Faba bean can be successfully grown in association with a cereal. For example in organic agriculture, in France, it has been sown with triticale and yielded satisfying amounts of grains. Mixing faba bean with a cereal had a positive effect on crop quality, which had a higher protein content than pea-cereal mixtures. 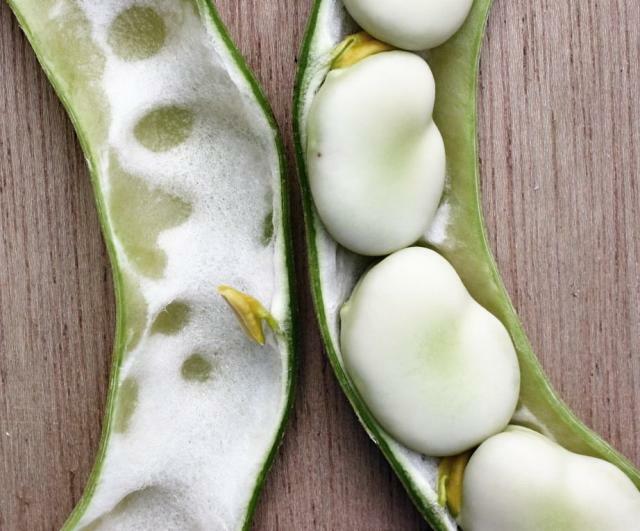 Faba bean is also less prone to lodging than field pea, making harvest easier (Métivier, 2014). Faba bean seeds mature 90-220 days after planting depending on the region (Muehlbauer et al., 1997). Average seed yields are about 1.8 t/ha but yields vary widely depending on region or environment (FAO, 2014). Yields as low as 1.1 t/ha or as high as 9 t/ha have been reported in China and Argentina respectively. In Western Europe, yields varied between 4.4 t/ha (Belgium), 3.6 t/ha (France) and 4.0 t/ha (UK) (FAO, 2014; Muehlbauer et al., 1997). The harvesting of winter faba beans can begin earlier than that of spring faba beans. Winter faba beans are a suitable crop for areas prone to summer droughts. Harvesting can begin once most stems are defoliated but still green. The seeds should contain no more than 12% moisture for adequate storage, or should be stored in aerated silos to prevent heating and loss of quality (Matthews et al., 2003). Windrowing helps to lessen moisture content and prevent spoliage: the plant is cut when green, before the stand lodges or the pods shatter. This method hastens the harvest, resulting in higher yields, as the plant is cut at a lower height and more pods are harvested (Matthews et al., 2003). Once harvested, faba beans should be handled carefully so that they do not split. Silo temperature must be carefully monitored as seed temperature may reach 35°C. Control of bruchids is necessary for good storage (UNIP, 2014). Faba bean is a potent and efficient N-fixing legume. In Australia, it was reported to contribute 270 kg/ha of N to the soil, resulting in increasing yields (+ 1-1.5 t/ha) and protein content (+ 0.7-1%) in the following wheat crop. These improvements were not only due to N fixation but also to positive effects of the faba bean crop for controlling certain wheat diseases (crown rot and nematodes) (Matthews et al., 2003). Faba bean is also used as green manure, to provide large quantities of N to spring-sown species such as maize or vegetables. In Switzerland, faba bean can be sown in September, in mixtures with common vetch (Vicia sativa) or field pea, in order to be mulched and ploughed under during spring (Clerc, 2013). Faba bean seeds are rich in protein (25-33% DM) and starch (40-48% DM) and are, therefore, a valuable source of protein and energy for livestock. They have a moderate content of fibre (crude fibre 7-11% DM). Their composition is similar to peas, though they are richer in protein (+ 5 percentage units), crude fibre (+ 2) and poorer in starch (- 6). Compared to maize grain, they tend to have a lower energy content for ruminants, pigs and poultry, due to their higher fibre content. The presence of antinutritional factors is a bigger problem in monogastric species than in ruminants. The amino acid profile has a high lysine content (5.4-6.8%) and is relatively deficient in sulphur-containing amino acids (0.6-1.0% methionine). Faba beans contain about 1% lipids in the DM, with a high proportion of linoleic and linolenic acids, which makes them susceptible to rancidity if ground and stored for more than about a week. Faba beans are a relatively poor source of calcium and are low in iron and manganese. Faba beans contain lower levels of biotin, choline, niacin, pantothenic acid and riboflavin, but a higher level of thiamin, than soybean meal or rapeseed meal (Blair, 2007). Faba bean seeds contain 12% hulls, which are rich in fibre (crude fibre 54% DM) and low in protein (6% DM) (Marquardt et al., 1975). Dehulled faba beans have a higher nutritional value than non-dehulled beans as they contain more protein and starch and much less fibre (50% less NDF) (Marquardt et al., 1975; Ferruzzi et al., 2009). 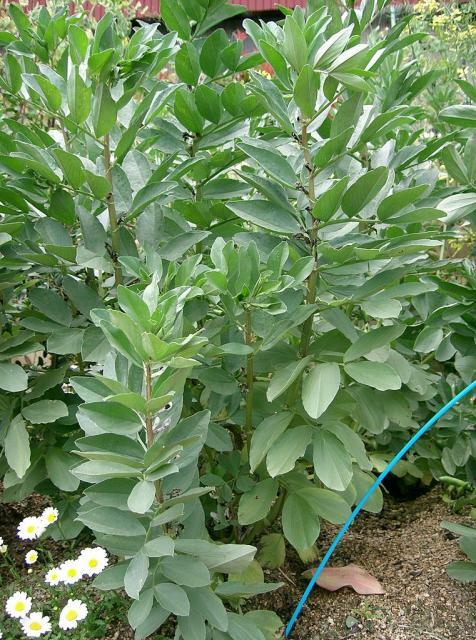 Fresh faba bean forage is of relatively good quality, with a protein content ranging from 14% to more than 20% DM. The highest protein content occurs at full flowering stage and decreases thereafter (Alibes et al., 1990). Faba bean straw has a much lower protein content (5-11% DM) with potentially high concentrations of lignin and ash. Like other Vicia species, the seeds of Vicia faba contain numerous antinutritional factors, notably tannins, pyrimidine glycosides (vicine and convicine), protease inhibitors, lectins, and phytic acid. The seed teguments of faba beans contain variable amounts of tannins, especially condensed tannins (proanthocyanidins), depending on the variety: some varieties are tannin-free while other contain 0.5-1% DM condensed tannins. The flowers of tannin-rich cultivars grown in Europe display a large black spot on the petals, and are often coloured in pale pink, pink or red, while tannin-free cultivars have white flowers (Crépon et al., 2010). Tannin-rich faba beans were found to have lower in vitro digestibility (Bond, 1976) and lower in vivo digestibility in pigs and poultry, whereas tannin-free cultivars have higher protein and amino acid digestibilities (Grosjean et al., 2001; Gatel, 1994; Crépon et al., 2010). This effect has not been reported in rabbits (Lebas, 1981; Seroux, 1984). The cotyledons of faba beans contain high concentrations of vicine and convicine (up to 1% DM or more, Lattanzio et al., 1983). These are pyrimidine glycosides responsible for favism, an acute hemolytic disease resulting from oxidative damage in red blood cells that affects human populations suffering from glucose-6-phosphate dehydrogenase deficiency (Enneking, 1995). Vicine and convincine are not toxic per se but are hydrolysed by ß-glycosidase in the intestine into divicine and isouramil. Low vicine and convicine cultivars have been developed (Duc et al., 1999). Vicine and convicine were not shown to affect faba bean digestibility in pigs but they were reported to be responsible for lower egg weight in laying hens (Lessire et al., 2005; Grosjean et al., 2001; Gatta et al., 2013). Trypsin and chimotrypsin inhibitors and lectins are present in faba beans but their activities are low compared to other legume seeds (Thacker, 1990; Vidal Valverde et al., 1998). The trypsin inhibiting activity of faba beans seems similar to that of spring peas cultivars (Gatel, 1994). The phytic acid concentration of faba bean was reported to be in the range 0.2-0.7% DM and to be generally lower than that of the common bean (Phaseolus vulgaris, 0.5-1% DM) (Vasic et al., 2012). Faba bean seeds are highly digestible in ruminants (OM digestibility 91%) and are comparable to peas (Abreu et al., 1998; Micek et al., 2012; INRA, 2007). They provide rapidly degradable dry matter and protein for microbial protein synthesis, similar to, or greater than that provided by lupins and vetchs. The rapidly degradable fraction ranges from 25 to 38% for DM, and from 34 to 52% for protein (Yu et al., 1998b; Goelema et al., 1998; Goelema et al., 1999; Gonzalez et al., 2003; Ramos Morales et al., 2008). Effective degradability of DM and protein have been found to be greater in goats (Ramos Morales et al., 2008) than in sheep (Gonzalez et al., 2003). It has been estimated that extruded faba beans may provide as much digestible by-pass protein as soybean meal (more than 12% DM), which is higher than for other raw or processed legume seeds such as pea or lupin (Masoero et al., 2005). Faba bean seeds have been used successfully up to 4-5 kg/d in dairy cow diets in partial or total replacement of soybean meal or rapeseed meal, mainly in maize-based diets. Replacing rapeseed meal with faba beans in isoenergetic and isoproteic diets did not affect voluntary total intake, milk production and milk composition (Brunschwig et al., 2002; Trommenschlager et al., 2003; Brunschwig et al., 2004). In high-yielding cows (25-30 kg milk/day) fed a concentrate containing 20% faba beans, antinutritional factors did not affect milk production, milk composition, cow health, rumen digestion and mineral metabolism (Melicharova et al., 2009). In diets where faba bean represented 50% of the protein supply, replacing 4 kg of raw seeds with 4 kg of extruded seeds had no effect on rumen fermentation, on duodenal, ileal or faecal flows, and in vivo OM digestibility. Extrusion increased rumen digestion of starch and decreased rumen digestion of protein, thereby improving efficiency of rumen microbial synthesis and duodenal non-ammonia nitrogen flow (Benchaar et al., 1992). No information about feeding faba beans to beef cattle was available at the time of writing (November 2014). Faba beans were highly palatable for lambs, who preferred them to barley (Delmotte et al., 2006). In growing lambs and fattening sheep, including 30% faba beans in isoprotein and isoenergetic diets in substitution for soybean meal (13% of the diet, Surra et al., 1992), or lupin seeds (18% of the diet, El Maadoudi, 2004), did not affect intake, performance and digestibility. In lambs, including faba beans at up 50% of the diet did not affect meat quality when compared to soybean meal (Lanza et al., 2007). Young growing lambs (60-110 day old) fed faba bean seeds (50-60% of the diet), as the sole protein source to supplement cereal straw, had a daily weight gain of 250 g/d, with an average DM intake of 1.18 kg/day (0.65 kg/d of faba bean). Supplementation with lysine and methionine did not increase the growth rate, demonstrating the already high protein value of faba beans for growing lambs (Antongiovanni et al., 2002). Two trials in India have studied the effect of formaldehyde treatment of faba beans in goats. In low-yielding lactating goats fed straw supplemented with faba beans (30% of the diet, 0.4 kg/d), treating the seeds with 0.4-0.5% of formaldehyde did not improve milk production, total intake, DM and fibre digestibility, N balance and rumen profile (Tewatia et al., 1995). In goat kids, treating faba beans with 1% formaldehyde increased DM and protein digestibility, and N retention (Virk et al., 1994). 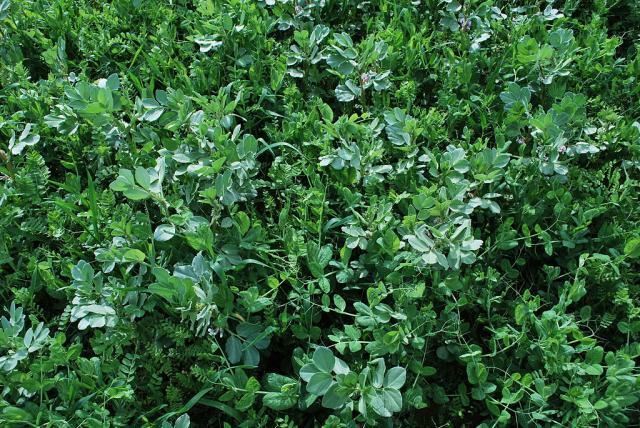 The voluntary intake of dairy cows fed fresh faba bean forage (whole plant) was high. When the forage was ensiled, voluntary intake decreased with maturity but remained high compared to other silages (INRA, 2007; Tisserand et al., 1976). Dairy cows in early lactation fed ensiled faba bean forage had milk yields (22.5 kg/d) and composition similar to that of cows fed a good grass-legume silage (McKnight et al., 1977). Faba beans are rich in protein and energy and are very palatable to pigs (Blair, 2007), but their use in pig diets may be limited due to the presence of antinutritional factors. In growing and fattening pig diets, the recommended maximum inclusion rate is 20% though rates up to 30% have been tested with success (Smith et al., 2013; Gatta et al., 2013; Blair, 2007; Ewing, 1997). Due to inconsistent results the recommended maximum inclusion rate of faba beans for sows is 10% (Blair, 2007; Ewing, 1997). Before being fed to pigs, faba beans are often ground to pass through a 3 mm screen (Blair, 2007). Among the antinutritional factors found in faba beans, tannins are the most detrimental to pig nutrition (van der Poel et al., 1991; Garrido et al., 1991; Marquardt, 1989; Jansman et al., 1989). The levels of trypsin inhibitor and lectin activities are not a concern in pig diets when faba beans are incorporated at levels up to about 20% (Blair, 2007). Vicine and convicine levels had little effect on protein and energy digestibilities (Grosjean et al., 2001). The DE value of faba beans in growing pigs depends on their tannin content: low-tannin varieties were found to have higher nutrient and energy digestibilities than high-tannin varieties (Flis et al., 1999; Grosjean et al., 2001). Low-tannin varieties have a higher DE value of 16.1 MJ/kg DM vs. 15.5 MJ/kg DM for high-tannin varieties (Sauvant et al., 2004). The standardized ileal digestibilities of protein and amino acids are lower for faba bean than for soybean meal (Sauvant et al., 2004; Jezierny et al., 2011). Recommended levels of inclusion range from 18 to 30%. In growing pigs (14-36 kg), the use of up to 30% faba bean to replace 25, 50 or 75% soybean meal resulted in increasing daily weight gains, from 586 g/day (control) to 637 g/day (75% replacement level), and better FCRs (from 2.59 to 2.17 at 75% replacement level) (Kasprowicz et al., 2005). In fattening pigs, faba beans at 18% of the diet, partially replacing soybean meal, did not affect health and metabolic parameters (Giuliotti et al., 2014; Gatta et al., 2013). In growing and fattening pigs fed isoenergetic and isoproteic diets with faba bean included at up to 30%, gradually replacing soybean meal, increasing levels of faba bean had no effect on average daily gain, feed intake and FCR for growing pigs, but had a slightly reducing effect on the average daily gain of finishing pigs. No deleterious effects were observed on carcass quality (Smith et al., 2013). Faba bean compared favourably with lupin meal in growing-fattening pig diets: it resulted in higher feed intake, growth rate and a better FCR (Brand et al., 1995). Feeding growing and fattening pigs with up to 30% faba bean did not change carcass quality parameters (eye muscle area, backfat thickness and dressing percentage) (Smith et al., 2013; Gatta et al., 2013; Brand et al., 1995). Feeding faba bean to replace soybean meal did not impair intake and it increased daily gain during all stages of growing and fattening. Moreover, it was shown that feeding pigs with faba bean had a positive effect on the omega 3:omega 6 ratio of the fat. The pigs fed on faba bean yielded hams with more intense taste than those fed on soybean meal or field peas (Prandini et al., 2011). 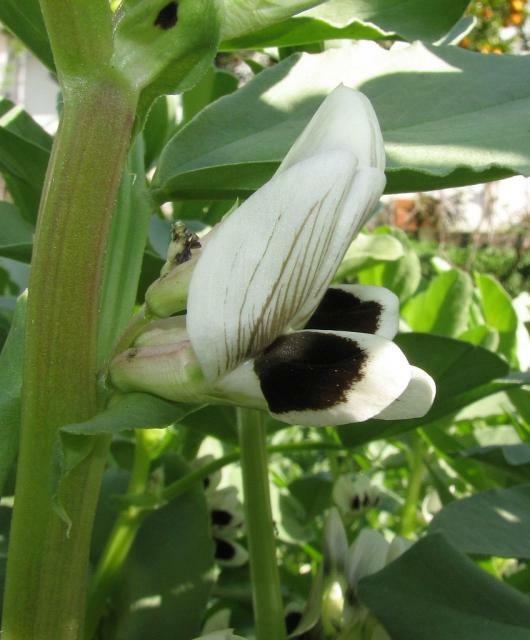 In Italy, faba bean was reported to be a valuable protein supplement for pigs grazing in woods. Outdoor-reared pigs were successfully fed on 22% faba bean (Acciaioli et al., 2007). While it is agreed that tannin-rich faba beans are less digestible than low-tannin seeds, the effect of faba bean tannins on pig performance is disputed. An early experiment with growing pigs showed that animals fed diets containing high-tannin or low-tannin faba beans (30%) had a similar N retention, growth performance and feed efficiency (Flis et al., 1999). Later trials have been more decisive on the benefits of low-tannin cultivars. Low-tannin faba beans resulted in similar voluntary feed intake and carcass quality when they were included at 30% of the diet to replace soybean meal in growing pig diets (Zijlstra et al., 2004). Low-tannin faba beans were included at higher rates (35 vs. 20%) than high-tannin beans in fattening pig diets (Royer et al., 2010). In growing pigs, dry heat or extrusion processing of faba beans increased their amino acid digestibility values and resulted in higher body weight gain and better carcass quality (Wetscherek et al., 1995 cited by Blair, 2007). Information on the use of faba beans for sows is limited. Trials from the 1970s showed that faba beans included at 21% as a replacement for soybean meal did not affect reproductive performance, but Danish trials reported that an inclusion rate of 17% resulted in reductions in litter size and piglet weight at birth and weaning, and in milk production by the sow (Pond et al., 1984 cited by Blair, 2007). Faba bean is a protein- and energy-rich seed that can be valuable in poultry feeds, though less so than field peas (Métayer et al., 2003). Its nutritional value depends on composition, antinutritional factors and processing. In broilers, diets including up to 25% high or low-tannin faba beans have not affected growth performance (Métayer et al., 2003). Such high levels are possible in diets that are well-balanced for amino acids (especially methionine and tryptophan), and when the beans are processed (dehulled, extruded or pelleted) to increase their digestibility. There are contradictory results about the respective value of low and high-tannin faba beans for poultry. One study reported that low-tannin faba beans included at 20% in broiler diets resulted in higher live-weight gain and feed intake than those obtained with high-tannin beans (Brévault et al., 2003). However, other studies reported no differences in performance when high or low-tannin seeds were included at 25% in broiler diets, even though the ME value of the high-tannin beans was lower (Métayer et al., 2003). However, slight differences in amino acid digestibility have been reported (Masey O'Neill et al., 2012). Studies have established that vicine and convicine reduced egg production in laying hens (Guillaume et al., 1977; Fru-Nji et al., 2007; Olaboro et al., 1981). As a consequence, the maximum recommended inclusion rates for faba bean varieties known to contain vicine and convicine are about 5-7%. Inclusion rates for varieties free of vicine and convicine can be up to 20% with no detrimental effect on laying performance (Lessire et al., 2005; Magoda et al., 2011). Faba bean seeds can be used safely in rabbit feeding (Benoit et al., 1948). They have been included in well-balanced diets at 15-25%, and even up to 30%, without any problems, as a source of protein (80% digestibility) and energy (DE 14.8 MJ/kg DM). In a cafeteria test, raw faba beans were well consumed by growing rabbits, in similar proportion (27%) to raw peas (33%) and raw soybeans (28%). On the other hand, toasted faba beans, peas and soybeans were poorly consumed (less than 5%) (Johnston et al., 1989a). 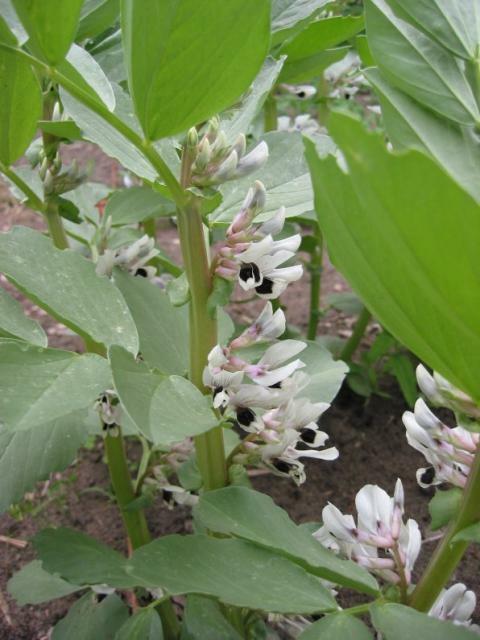 Several studies have shown that faba beans can be used in growing rabbit diets at 10-20%, and up to 37%, as a complete substitute for soybean meal and other oilseed meals (Colin et al., 1976; Lebas, 1981; Berchiche et al., 1994; Berchiche et al., 1995a). The proportion could be increased safely up to 57% for growing rabbits and lactating does (Johnston et al., 1989a; Johnston et al., 1989b). However, with this unbalanced diet (57.5% faba bean + 36.5% maize + 6% minerals and vitamins), the growth rate of young suckling rabbits was significantly lower than with a diet containing soybean meal: 9.0 vs. 13.6 g/d. The daily gain of fattening rabbits was similar to that of the control group (Johnston et al., 1989b). Comparisons of low and high-tannin faba beans resulted in similar growth rates (Lebas, 1981; Seroux, 1984). The proteins of faba bean are deficient in sulphur-containing amino acids and provide only about 53% of the requirements (Lebas, 2004). Supplementation with other raw materials richer in sulphur-containing amino acids or with synthetic methionine significantly increased growth rate and carcass yield without depressing feed efficiency (Berchiche et al., 1994; Berchiche et al., 1995b; Lounaouci et al., 2008). Fresh faba bean forage has been used as common green forage for rabbits in Sichuan, China (Pu et al., 1990). In Egypt, sun-dried leaves replaced 75% of soybean meal in the diets of growing and breeding rabbits without any negative effects (Magouze et al., 1998; Mahmoud et al., 1998). Oven-dried faba bean straw (harvested at maturity when leaves of the lower third of the plant were already dry) was included at 25% in isonitrogenous diets for growing rabbits as a substitute for oven-dried berseem or alfalfa hay (incorporation level 25%). Average daily gain (37.6 vs. 38.0 g/d) was not affected by the substitution, but the low protein content of faba bean straw (8-9% DM) required an increase of the soybean meal proportion in the diet (Asar et al., 2010). Faba bean seeds are rich in protein and carbohydrates and have been tested as a potential substitute for other protein sources (fish meal, soybean meal, gluten) and carbohydrate sources (cereal grains) in fish feeding. However, like many other plant proteins, faba beans contain fibre and antinutritional factors, especially tannins, that are detrimental to feed intake, feed efficiency and metabolic parameters in fish (Buyukcapar et al., 2007; Burel et al., 2014; Nilson et al., 2011). It is generally included at levels ranging from 15 to 35% in fish diets, depending on species. It has been suggested that the use of low-tannin varieties could be a valuable option in aquaculture (Nilson et al., 2011). Dehulled seeds, which contain less fibre and tannins, have a higher nutritive value (Kraugerud et al., 2011a). The inclusion of faba bean in feed pellets improved their hardness and physical quality (Kraugerud et al., 2011b). Raw or expanded faba beans included at 26% (20% of dietary protein) in rainbow trout diets, as a partial replacement for fish meal, resulted in increased specific growth rate. Expansion slightly improved performance (Gouveia et al., 1993). Up to 15% faba beans were included in the diets of rainbow trout fingerlings as a partial substitute for soybean meal, with a positive effect on growth and feed conversion ratio (Ouraji et al., 2013). Whole or dehulled faba bean included in Atlantic salmon diets at up to 24% of the diet as a partial replacement for fish meal did not result in significantly different nutrient digestibilities (including amino acid digestibility) and intestinal viscosities compared to the control diet. Dehulling did not improve diet digestibility (Aslaksen et al., 2007). Faba beans were included in diets for gilted sea bream at up to 35% as a partial replacement for cereal gluten and wheat grain without negative effects (Adamidou et al., 2011). Faba beans included at 15% of the diets of sea bass significantly improved the apparent digestibility coefficients of protein, starch and energy, as well as the gastrointestinal evacuation time (Adamidou et al., 2009a). Extruded faba bean included at 17% (DM basis) in sea bass diets as a partial replacement of fish meal and carbohydrate sources had no effect on fish growth or FCR. A higher level (35%) significantly reduced growth and degraded FCR (Adamidou et al., 2009b). The use of faba bean had a positive effect on pellet quality (Adamidou et al., 2009a). Faba beans were used at up to 24% of the diet, replacing up to 20% soybean meal in the diet of Nile tilapia fingerlings (17 g), with no effect on fish growth, FCR and flesh quality (Azaza et al., 2009). Feeding faba beans to Nile tilapia (199 g) resulted in slightly lower muscle quality (Lun Feng et al., 2007). Trials in China using faba bean in grass carp diets have led to contradictory results. Faba bean included in grass carp diets was shown to have significant effects on fish flesh quality. While it increased collagen and Ca2+ concentration, it decreased total amino acid and unsaturated fatty acid content, while increasing monosaturated fatty acids content (Liu BangHui et al., 2011; Li BaoShan et al., 2008). A later experiment showed that the inclusion of raw or dehulled faba beans increased total amino acids and crude lipid content in fish flesh as well as myofibril length and muscular fibre diameter (Mao Pan et al., 2014). 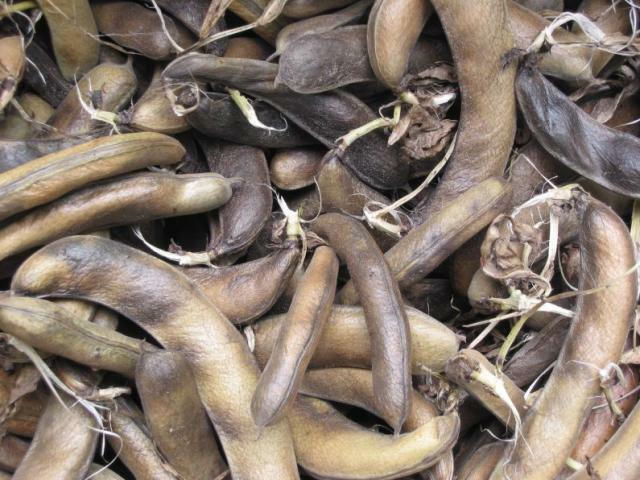 Faba bean was reported as a potential alternative feed for silver perch (Allan et al., 2000). Though it had lower DM and energy digestibility, its protein digestibility was more than 90% and overall amino acid availability was high (Allan et al., 2000). A comparison of faba bean, field pea, chickpea and vetch in whole, dehulled and concentrate forms, included at 30% in the diets of silver perch fingerlings, concluded that whole faba beans had the highest DM, protein and energy digestibilities but that dehulling faba beans did not improve their digestibility (Booth et al., 2001). Benoit, R. ; Daccord, A., 1948. Le lapin. Elevage, races, maladies. Librairie Payot Ed., Lausanne, 204 p.
Matthews, P. ; Marcellos, H., 2003. Faba bean. New South Wales, Dept. Primary Ind., Div. Plant Ind., AgFact P4.2.7, 2nd Ed. McVicar, R. ; Panchuk, D. ; Brenzil, C. ; Hartley, S. ; Pearse, P. ; Vandenberg, A., 2013. Faba bean. Gov. Saskatchewan, Agriculture, Crops. Passlack, N., 2010. Investigations on the influence of inulin and heat-processed faba beans on immunological parameters in sows, suckling and weaning piglets. In: PhD thesis, Univ. Berlin, Inst. Tierernähr. Fachbereichs Veterinärmed. 130 pp. Prolea, 2014. Les graines : pois, féveroles, lupin. Prolea. L'alimentation animale.